Fusion food is a pretty common term in Kolkata cooking circuit. But, getting a proper fusion food, where cooking styles or flavors complement each other, is difficult. 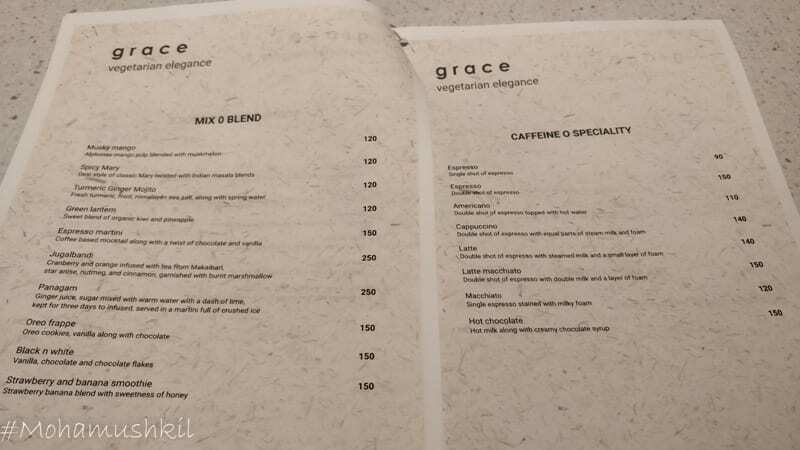 Luckily, I met chef Ritabrata Biswas at Grace, the vegetarian cafe at Kolkata Centre For Creativity, who has done a good job in modernizing Indian food. Blending two or more cooking styles or ingredients to create something entirely different, is what fusion food is about. But the challenge lies just there. 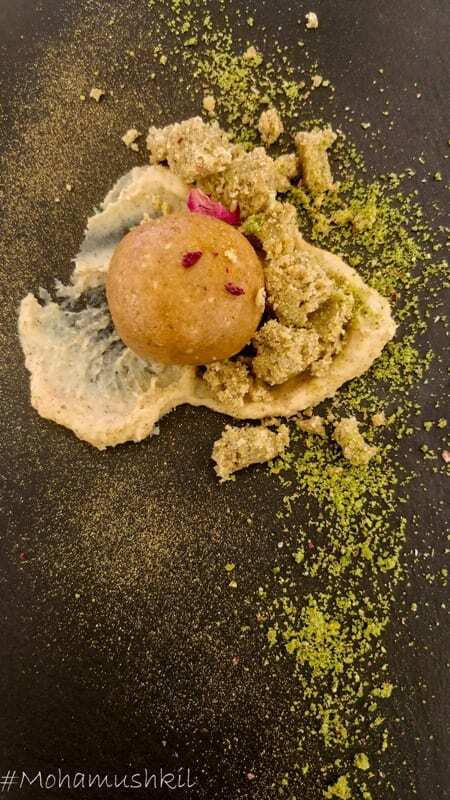 In most of the cases, the chef mixes ingredients without even understanding what they’re supposed to do and the result is as disastrous as it can be. In 1970’s the concept of fusion food was gaining its popularity with French chefs experimenting with Asian ingredients. But in most cases than the rest, what it produced, was more of a confusion cuisine. But on a broader scale, isn’t all food, with a blended past, are fusion food? How many food items are authentic? What is an authentic or pure food? These things were playing in my mind when I reached the Kolkata Centre For Creativity at Kasba. 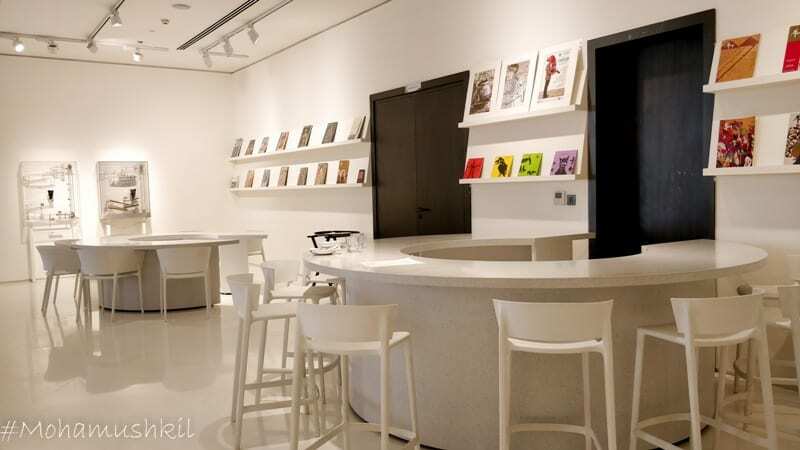 Well, it is an Art Gallery showcasing modern art forms and talents. 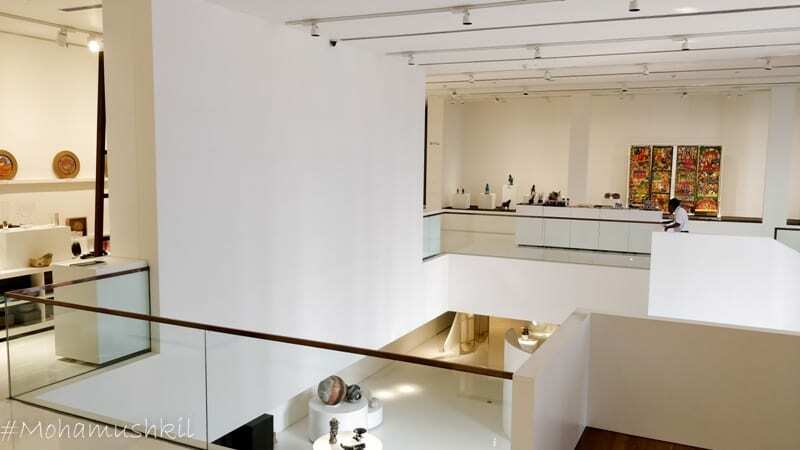 Built in with an amphitheater and numerous galleries, this place itself is fascinating. 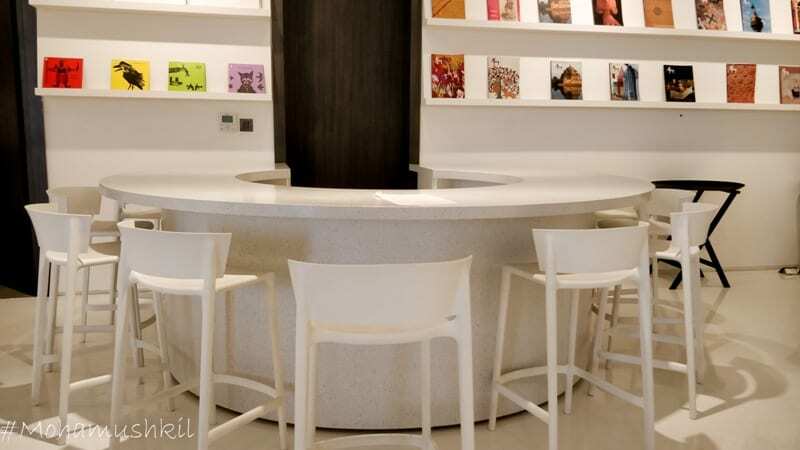 On the Second floor, is the Grace, the food arena- lovingly subtle with a touch of white all around the place and graced with natural light. You can check the location on Google map here. As Chef Ritabrata introduced the menu to us, it was evident that he loves his food. And more importantly, he loves to play around with his ingredients and cooking styles. He has been trained under Chef Priyam Chatterjee, has traveled enough to widen his vision. 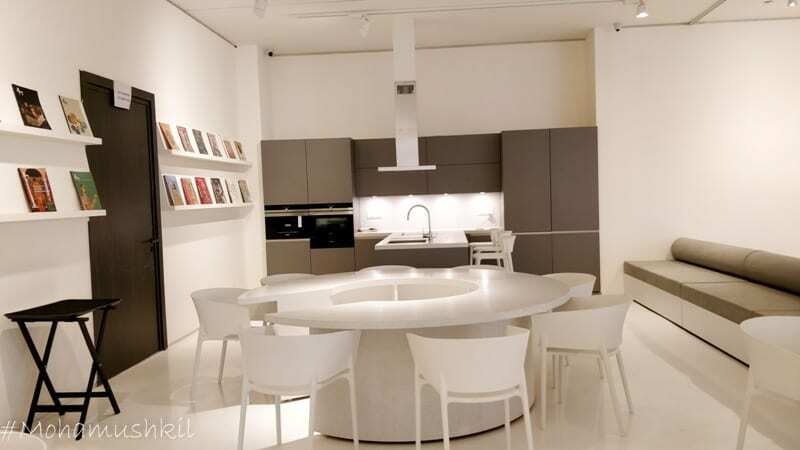 And luckily, has got the freedom to experiment around under the guidance of Reena Dewan. And he introduced me to their tasting menu. So, let’s come down to food now. The first item was called Nostalgia. 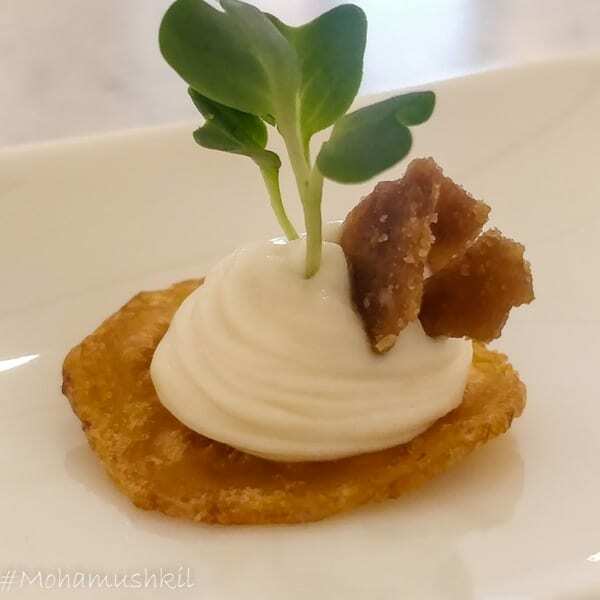 A small piece of banana chips topped with smoked bandel cheese mousse and chat masala praline with a sprig of microgreens. And I was stunned. The detailing to the minute level was mind boggling. And it’s actually what a fusion food should be- a burst of flavors. 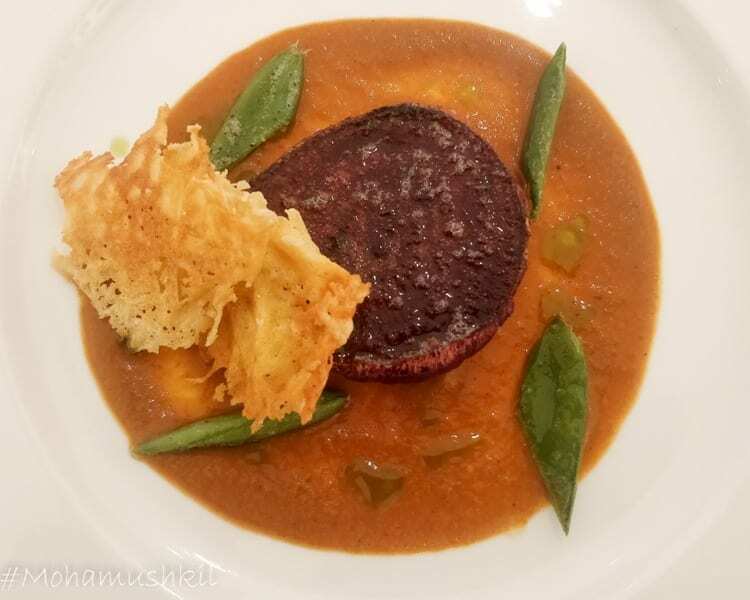 I’ve had food at many a places, but having a mousse of bandel cheese, the smoky flavor with chat masala, is something, that have set the tune right. The next dish was called a Salad. Chef liked French food, but with an Indian (or should I say Bengali) touch. So, it was Hoogly cheeese and Aragula with plum and Hoysin dressing. Pcs of orange and batabi lebu is thrown in with some dried yellow rose petals. The good part in this salad was, all the items were properly complementing each other and none of them had any individual identity. 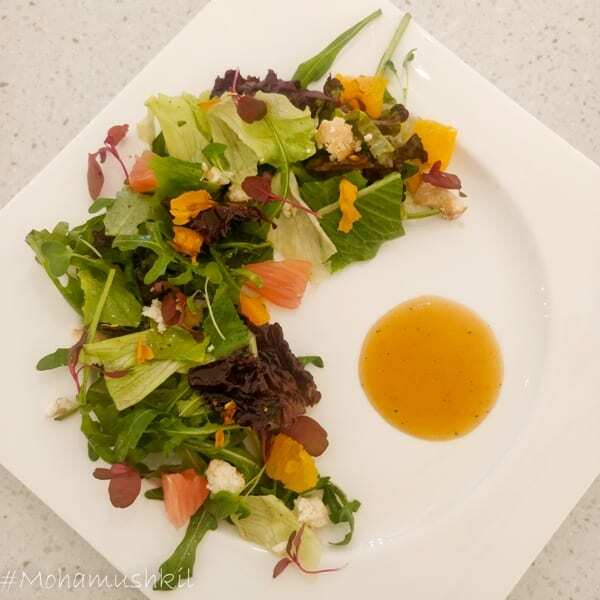 The sourness of the citrus food blended well with the sweet dressing and got elevated by the shaving of cheese. For the heavy dressing lovers, a side of dressing was provided. And it’s a mocktail time now. 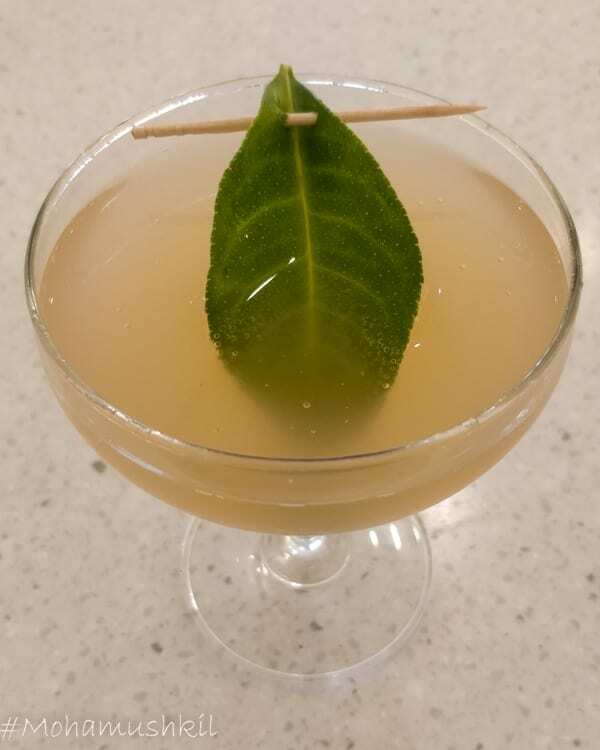 KCC doesn’t have the liquor license and I believe it doesn’t intend to either. But what we had was again a carefully crafted fusion mocktail. 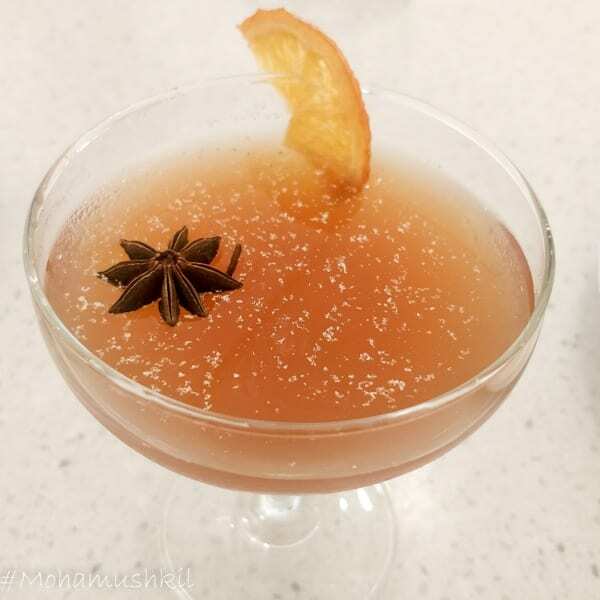 It was called jugalbandi, where cranberry juice is mixed with orange juice, darjeeling tea and infused with mixed Indian spices. It had the strong Indian spice-smell and fruity aroma. We all have loved Aloo Kabli. Yes, out childhood crush. 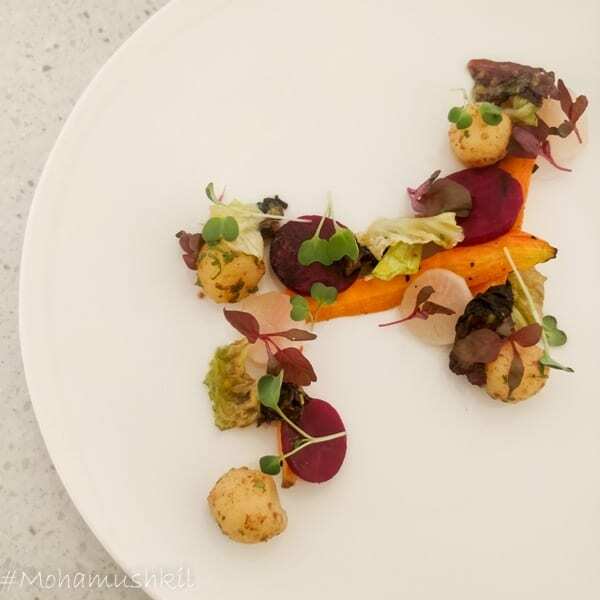 But what if the same dish gets a makeover as a fusion food, with compressed radish, pickled beetroot and dressed in orange chilly dressed lettuce and coffee bean roasted carrot? The result is magical. The dish is a bit complicated, yes I understand. But amazing taste-wise. If the Bengali Aloo Kabli is there, can a Papri Chat be far behind ? 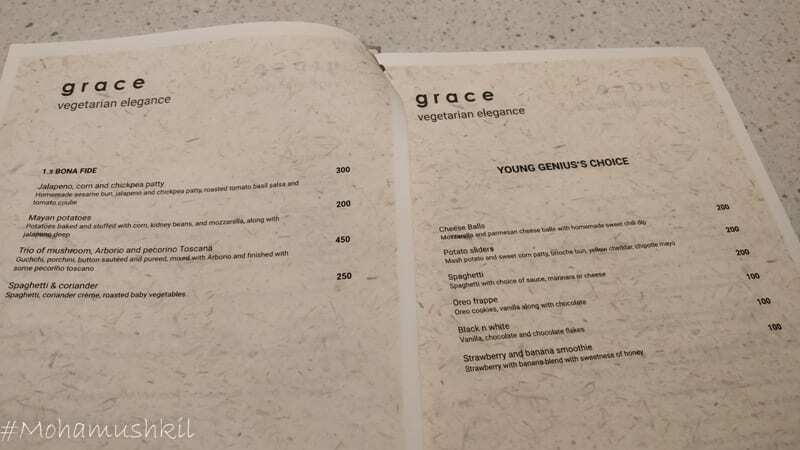 And with the legacy of fusion food at Grace, it also got a makeover. 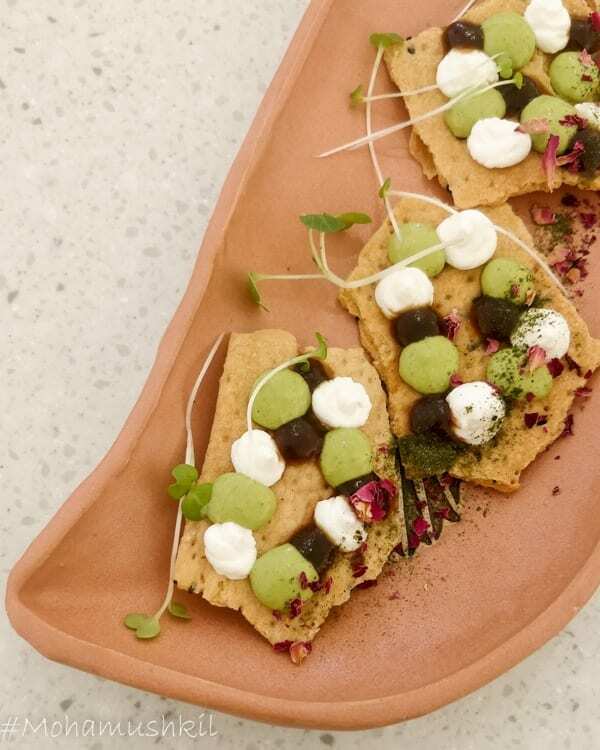 The baked papri was topped with droplets of coriander wasabi, sweetened yoghurt, am ada glaze and dried kashmiri rose petals- the whole thing is sprinkled with spinach and chat maala. The dishes looked like small portions, but I was soon getting filled up. But the main course was yet to start. For the first dish, I was served medium rare beetroot with Kolahpuri gravy and parmesan chips. The gravy was much subdued and customized. When asked about the same, the chef replied that it’s due to the fact that he wanted to save the beetroot from the dominating nature of the Maharashtrian gravy. Not that I really disliked, but I personally like my gravy to be hot and spicy. The baby vegetables were perfectly blanched and not boiled- the crunchiness was their alright. Another mocktail came. This time, it’s a fermented ginger beer with strong aftertone. I was told, it’s done to help in digestion. 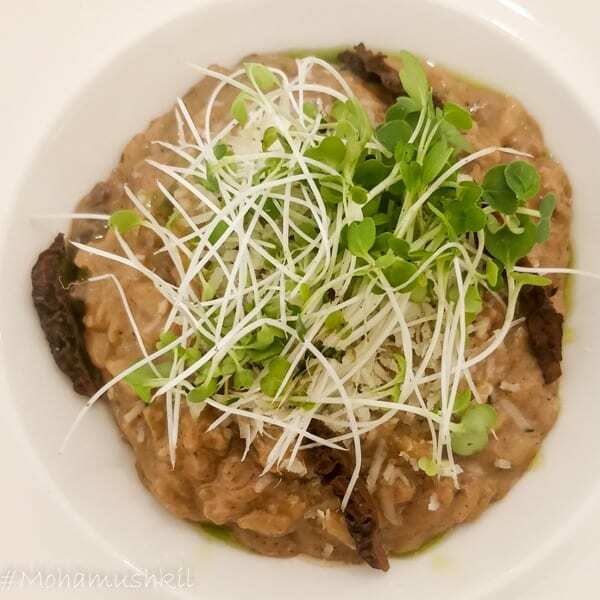 And especially when the next dish came, it was a Risotto and Guchhi is used as the mushroom apart from the usual mushroom paste. Now, seldom I’ve seen a truffle oil of Guchhi is used in places other than a five-star hotel. And in this price range, it’s almost impossible and I’m not sure how they’re managing it. But why should I bother? 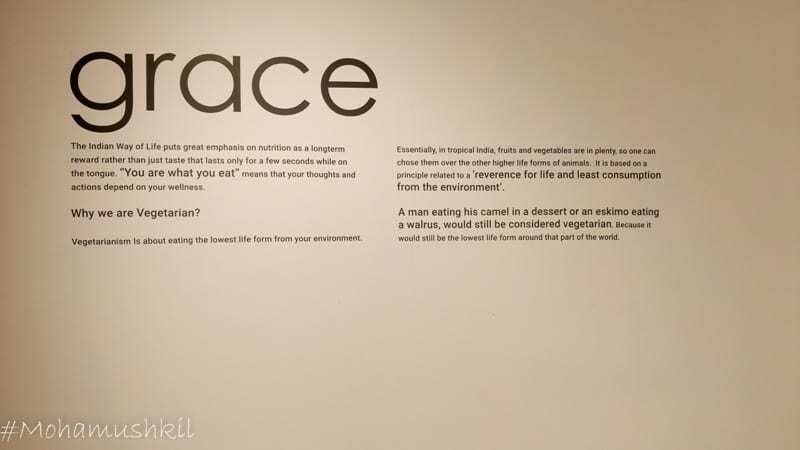 Rather I should enjoy my food. The smoky flavor from the Guchhi and mushroom paste was evident. I am not really fond of the smell of Truffle oil, but it was pretty well balanced here. Fusion food is one of the most misused terms these days and nobody can deny that. But a true fusion food is where the different elements are broken out of their stereotyped form to create something new. And Chef Ritabrata did just that in this place. 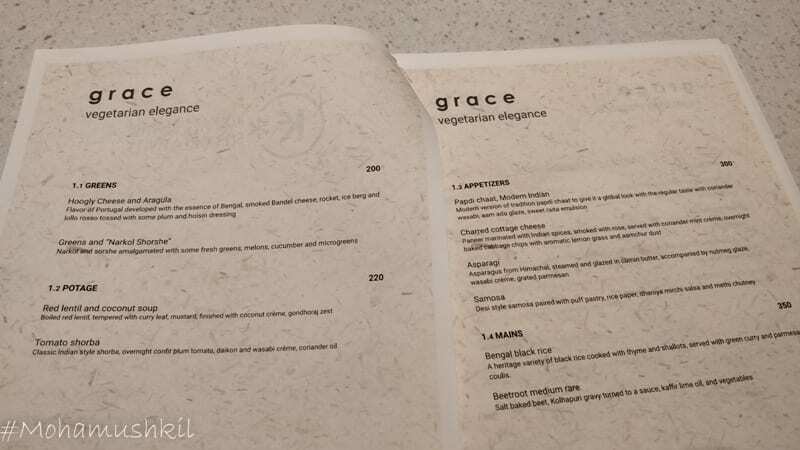 I’m still not sure how long he can keep up this superior standard of food and presentation in Kolkata, but for somebody who loves to experience a modern Indian food, Grace at Kolkata Centre OF Creativity is a must go. 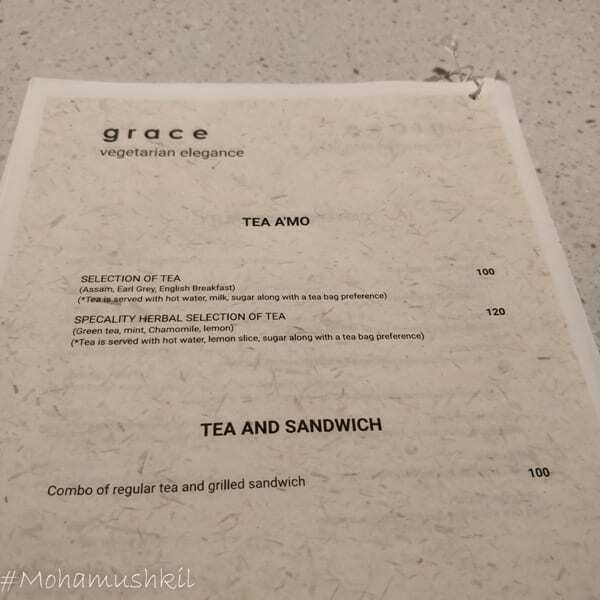 I was just in Calcutta last week – wish I had seen this sooner and I could have gone to Grace. Great post. Especially loved your writing on fusion food. Beautiful post with new style of recipe. Thanks, I am honored. But recipe ???? great review , you should visit Becky’s Kitchen The Hague hen you have a chance!